The USS Voyager is an Vivace Class/Voyager Subtype Command Cruiser that was launched in 2401. Following its triumphant return after being lost in the Delta Quadrant, the USS Voyager NCC-74656 served with distinction for many years until it was decided that the famed Intrepid Class vessel had reached maturity. Because of the legacy of the Starship Voyager it was quickly decided by Starfleet Headquarters that the name Voyager would live on as part of the new Vivace Class line of starships with construction on the new USS Voyager beginning in early 2395 at Utopia Planitia Fleet Yards, Mars. 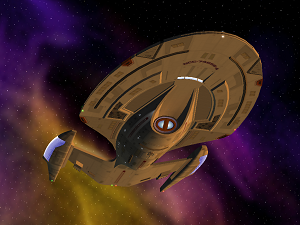 As construction began on the Starship Voyager, the Starfleet Corps of Engineers reviewed testing details from the prototype Starship Vivace and noted several irregularities with the vessel involving Propulsion Systems and Computer Systems. Due to this immediate changes were called upon to overcome these deficits as the Vivace had proven itself to be underpowered for a vessel of its size and purpose. Through the dedicated work of B'Elanna Torres-Paris - former Chief Engineer of the USS Voyager - design modifications were implemented upon the Warp Drive creating a new combination Warp and Slipstream Core that would power the vessel. Due to this change each Vivace Class vessel was immediately upgraded with these new technologies creating the Voyager Subtype of the Vivace Class. After a relatively uneventful construction phase following these changes the Voyager was launched under the command of Captain Tom Paris on a five year exploration mission in the Zenas Expanse of the Alpha Quadrant. Shortly after being launched Voyager was recalled in order to capture the renegade USS Lindberg after it pledged itself to aid the Gorn Hegemony in their fight against the Klingon Empire. Voyager was able to recover the Lindberg, but her Captain was able to evade capture. Voyager itself returns to active exploration duty and in 2402 makes contact with the Lorians, a genetic offshoot of the Xindi. Voyager continues its exploration mission and makes first contact with 7 other new species before being recalled in 2404 due to growing unrest between the Federation and Klingon Empire. Voyager is assigned to patrol the Hromi Cluster and assist with evacuation efforts. In 2405, during the Klingon Empire's expulsion of Federation citizens from Korvat, Voyager was assigned to oversee the Blockade of Korvat shortly following the declaration of war. When open hostilities erupted, Rear Admiral Tuvok was assigned to oversee Starfleet Operations in the Khitomer Sector by Starfleet Headquarters and selected Voyager as his command ship for the Khitomer Sector. Voyager itself led multiple campaigns during the conflict including the devastating Battle of Gateway in which the Klingon Empire attempted to conquer the Planet Gateway. Tuvok would assume full command of Voyager, in addition to his role as Khitomer Sector Commander, following the promotion of Tom Paris to the rank of Rear Admiral and Commander of Spacedock in 2408. Following the armistice between the Federation and Klingons in 2410, Voyager was assigned to a top secret mission of exploration in which it returned to the Delta Quadrant under the continued leadership of Rear Admiral Tuvok beginning in 2411. The mission was, however, short lived with all Starfleet forces were recalled from the region in 2412 due to growing threats against the Federation issued by the T'saz. Admiral Tuvok opted to step down from his post as Commanding Officer of Voyager due to the cancelation of the Delta Initiative and command of Voyager was returned to Captain Tom Paris. Under the leadership of Captain Paris, Voyager would be instrumental in assisting with the evacuation of Qo'Nos due to the atmospheric breakdown caused by the Praxis Event and assisted the Starship Enterprise in ending the Bluegill threat of 2416. At the conclusion of 2416 Voyager was launched on a deep space exploration mission to the Deep Beta Quadrant beyond the furthest borders of the Federation into Wild Space on a five year mission of exploration under Captain Paris. At the conclusion of the mission Voyager returned to Federation territory in 2420 where it encountered a Supremacy Battleship and came under attack. The Supremacy, led by Vaadwaur General Gaul, was aware of Voyager and its legacy and decided not to destroy the ship but rather make it a message to the Federation. Left adrift near the border of the Hotep Sector, it would be nearly a full month before rescue ships were able to retrieve Voyager. The damage was extensive and only a third of the vessel's crew were able to survive. Severely damaged, Voyager was sent to the Beta Antares Fleet Yard where she would undergo intensive repairs. Voyager returned to service in 2423 after what became a far more intensive reconstruction than initially anticipated and was further enhanced with the latest developments in technology to keep Voyager on the cutting edge. As Captain Tom Paris had retired from active service, at the insistence of Admiral Chakotay Starfleet Headquarters agreed to appoint Miral Paris, daughter of Tom Paris and B'Elanna Torres-Paris to the position of Commanding Officer of Voyager. As part of its shakedown, Voyager assisted with the recolonization of Solosos III and is assigned to colonial defense of the region for one year at which point it resumed an exploration mission scheduled to last five years. Despite its five year mission, Voyager was recalled from its assignment and transferred to Admiral Kor's Project Longshot in 2428, an assignment which is ongoing. The USS Voyager is the contemporary descendant of the Intrepid Class star of Star Trek: Voyager and is an NPC ship.